Every morning, the fine folks at Sports Radio Interviews sift through the a.m. drive-time chatter to bring you the best interviews with coaches, players, and personalities across the sports landscape. Today: Lieutenant Bligh Rex Ryan says everything's hunky-dory. 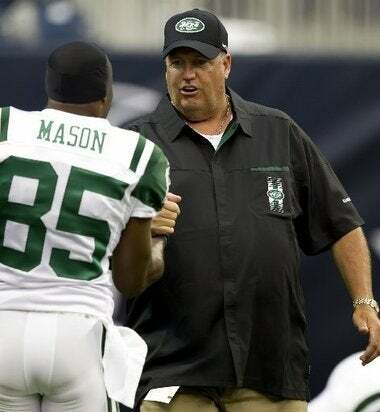 Rex Ryan joined 1050 ESPN New York with The Michael Kay Show to discuss the Jets' Week 5 loss to the New England Patriots, how he doesn't feel like the Jets' defensive personnel is incapable of getting the job done this season, disciplining Derrick Mason on Sunday by making him sit out the first half against the Pats, if it's at all possible that anyone in the organization would tell the press that the Jets wide receivers have a problem with Brian Schottenheimer and his play calling, if he's heard any direct dissatisfaction or complaints out of the mouth of Derrick Mason, Plaxico Burress or Santonio Holmes regarding Brian Schottenheimer's play calling, the Jets season being on the brink this week and the game against the Miami Dolphins this week being a must-win affair. What are your thoughts on the loss to the Patriots? "It's really what I thought. We played against a good football team. There's no doubt. Their offense is really executing at an historic level right now. They are pretty good, but we helped them. There's no doubt we helped them and those are the things we really gotta concentrate on because a team like that you gotta be 100% with your alignment, assignment, and technique. If you are not they are going to exploit you. We made enough mistakes to really help that football team. Like I said before they do not need a whole lot of help." With your defense doing what is has been doing lately could it just be the players aren't good enough this year? "I definitely have a ton of confidence in our players. There is no doubt. I think we ran into a good football team. One when you look at them…I don't know the exact numbers, but they are averaging over 500 yards a game for a reason. [Tom] Brady is on fire. He's got an excellent core of receivers and quite honestly they can run the ball better as we found out yesterday. We knew that was the case, but they are a more balanced football team. With that it kind of makes them harder to defend." Did you discipline Derrick Mason on Sunday? Is that why we didn't see him until the 3rd quarter of the game against the Pats? "No. I could tell you this: The decision not to play him was not related to anything he said in the media. I can tell you that much for sure. You guys know how I feel about it. We are not going to tell our guys what to say and what they can't say or anything like that. I did have a conversation with Derrick Mason regarding some things. I am not going to get into our conversation. It was a private conversation. That was definitely not a reason why and we said yesterday we tried to give Jeremy Kerley opportunities and I thought the young man played well. Going forward each game is different. When you approach things you look at match-ups and different things, but Derrick Mason has 985 catches or whatever it is. I mean a ton of catches. I think Derrick Mason is an excellent receiver and quite honestly he will have his opportunities in the future." Is there anyway that someone in the organization could have told the New York Daily News that the players did not like what Brian Schottenheimer was doing? "That one? This is the one we have a tough time with because supposedly all three of the guys [Derrick Mason, Plaxico Burress, Santonio Holmes] came into me and talked about it and things. Well that means I was involved in a conversation. I can tell you right now I never heard that kind of conversation with any of them. That's completely false." Did you ever hear any dissatisfaction from Derrick Mason, Plaxico Burress and Santonio Holmes about the way Brian Schottenheimer was calling the game? Is this team on the brink of ruining this season? "No. I can understand we lost three games in a row. How positive can you be? I'm saying this: It's right out there in front of us. We have to get this win against Miami on Monday. We finally get home. We talked about it forever. We gotta take care of our home field. This is an opportunity for us and quite honestly we have to win this." Is this game on Monday Night a must-win for the Jets against the Dolphins? Do you have to win? "I think we do. We gotta stop this losing skid and do it in front of our fans. Quite honestly Miami has beaten us at home the last two years, so we have to get better." • Pete Carroll would like to quash any QB controversy. • Stevie Johnson could get used to this thing called winning. • Ken Whisenhunt is a frustrated human being.